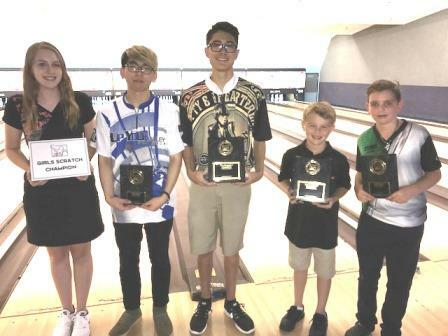 Cortez Schenck wrapped up a Bowler of the Year season in So Cal, while Gage Baker pulled off an incredible two-peat, in exciting action at the JBT Southern California Conference Invitational tournament, hosted by Cal Bowl in Lakewood. After five qualifying games, eleven finalists joined five exempt bowlers for a sixteen-bowler, triple-elimination matchplay filled with dramatic finishes. By round seven, Schenck was the only bowler left with just one loss, as a result of a win over upstart Costa Gastouniotis. In the same round, Harley Sweigart eliminated Kyle Duster, and Ryan Lee eliminated Cerell Cardines. In round eight, Lee stayed alive by beating Schenck, and Gastouniotis eliminated Sweigart, giving Lee a bye to the finals. Cortez ousted Costa in the semifinal rematch, and in the resulting one game title match, a missed 6-10 from Ryan late-game spelled the difference, as Schenck cruised from there for the win and the title. It's the 91st of his JBT career, and the triple-points win gives him an almost prohibitive all-conference points lead heading into the TPC. Cameron Criss was brilliant in the handicap division qualifying, cruising to the top seed, and survived into round seven of matchplay, falling to Allison Azvedo. The fifth place finish was enough to vault him into Bowler of the Year for So Cal however. Cameron's brother Brandon was eliminated in that round also, by Erik Hagen, while Gage Baker became the last one-loss bowler with a win over Ben Dinenberg. Baker then ousted Hagen in round eight while Dinenberg eliminated Azvedo, leaving Ben needing to beat Gage twice for the title. These two talented youngsters could be around JBT title matches for a long time, but for the moment it was eight year-old Gage with the experience edge over 13 year-old Ben. 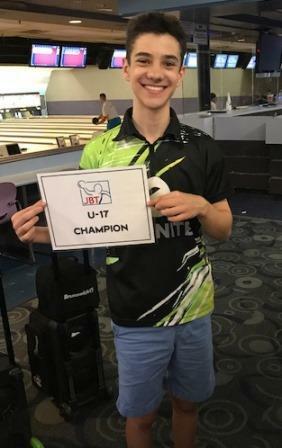 Both put on nervous performances in the first match, and in the end Gage put together the late frame marks that included a tenth frame spare to edge Dinenberg for the championship. 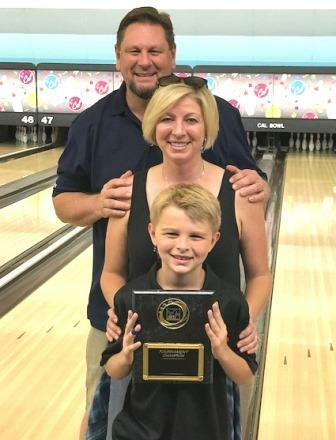 It's the second Invitational win in a little over a month for Gage, an amazing accomplishment at any age, let alone a single-digit age! Megan Carpenter avenged a title match loss the day before with a a win over Brittany Kolatzny to capture the Girls Scratch Invitational. Solomon Salama capped off a completely dominant So Cal U17 season with a win over Megan's brother Matthew Carpenter for the U17 Invite title. Thanks as always to the team at Cal for hosting us, as well as MSC for yet another fantastic scholarship contribution. The field is now set for the 2017 TPC, where 204 bowlers are eligible to compete for over $20,000 in scholarships in our most prestigious event of the season!